Watch the full report by clicking here. 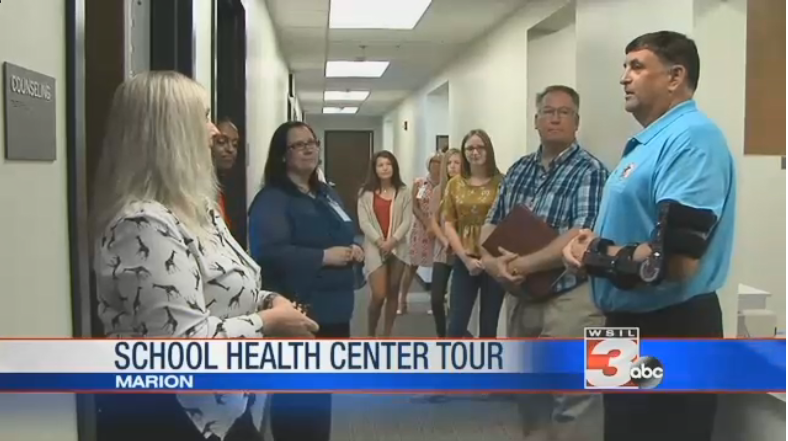 The Marion Wellness School Health Center welcomed Representative Dave Severin for a tour in honor of National Health Center week as reported by Hannah Gebresilassie of WSIL Channel 3. The week is centered around raising awareness about the mission of health centers across the nation and the dedicated staff who provide the care. The tour’s aim was to show support for community and school based health centers, like the one at Marion High School. They offer everything from preventative and sick care services to mental health services. Shawnee Health Service operates Marion Wellness School Health Center which serves students, parents, faculty and staff of Marion Consolidated Unit School District #2.